Looking for tips on discipline? Read on to learn about: having developmentally appropriate expectations, helping kids understand what is expected of them, modelling and rewarding desired behaviors, setting limits, and enforcing consequences. Discipline does not mean punishment after misbehavior has happened. Discipline means guidance. It means setting clear expectations for how we would like our children to behave, not assuming they know how. It means modeling for our children the kinds of behavior we would like them to display. It means setting clear limits about things they cannot do. And, it means that when they misbehave, we let them know that the behavior was not OK, but we do still love them, and we tell them how to be better in the future. This style of discipline not only guides behavior, it also builds trust and respect between parent and child. From birth to three, your child is going through massive developmental changes, with more brain growth than ever again. They learn through hands-on exploration of the world, which means they get into everything, and have no sense yet of what is safe and what’s not. Your role is to protect them as needed, but also allow them to explore and learn within limits. They learn through repetition, which means they need to do something over and over to learn it, and that includes misbehaving over and over and experiencing consequences over and over before they really remember the rule. Your role is respond consistently each and every time to misbehavior to help reinforce their learning. Discipline will be more effective (and you’ll be less frustrated) if you keep your child’s developmental capabilities in mind at all times. Do encourage them to stretch themselves and work on impulse control, but don’t expect more than they are capable of. Learn about developmental capabilities by reading books, looking online, taking classes, and by watching other kids. (Though it’s also important to remember that individual temperaments have a big effect on what kids are capable of, no matter their age.) For example, typically toddlers are not yet capable of sharing, have a hard time waiting and controlling their impulses, will bite and hit at times, and can’t always “use their words.” We ask them to do better, but we shouldn’t be surprised when that’s too much for them. Remember how little your children know about the world. They don’t know that you’re supposed to be quiet in some places and that it’s OK to be loud in other places until you teach them that. They don’t know that they need to stay at the table at the restaurant until you teach them that (and remind them again and again). The more you can tell them ahead of time what to expect and what is expected, the better. When they are young, keep it very simple: “this is a quiet place”, “you need to sit with me here”. As they get older, you can have codes. Like in our family “theater rules” means a place where you sit in a seat, and are quiet, unless everyone else is clapping or singing. “Catch” them being good – praise them for the positive behavior they demonstrate. Some people recommend you shoot for a ratio of 4 – 5 times where you tell them they’re doing something right for every 1 time you tell them they’re doing something wrong. When misbehavior begins, let them know that what they’re doing is not OK. (They might not know. Or they might, and are testing to be sure they understand.) Use a firm voice and a serious expression to convey this. It is confusing to toddlers if we use our regular sweet smile and playful voice when we’re telling them what not to do. Also, the louder your child gets, the calmer you need to be. Punish the behavior, not the child. Let them know you still love them, but the behavior was not OK. Use a calm and firm voice and expression, not an angry tone. No need to discuss this or re-hash it or re-negotiate it. Just be clear and move on. When anyone (or anything) is in imminent danger of harm, we need to act more quickly. There may not be time to suggest better behavior nor time to tell them what the consequences will be. You may just need to act quickly and explain later. Also, if your child is in a full meltdown tantrum or very wild and out of control, you won’t be able to reason with them. They’re not understanding language at that point. You may just need to remove them from the situation, go somewhere quiet till they calm down, and then explain things. How does your child respond to your no’s? How do you respond to that? When you set a limit, does your child beg, whine, and plead? Or throw loud dramatic tantrums? Or try to make you feel like a bad parent, shouting “you don’t love me!”? If so, do you give in? If you do, you teach your child that whining, tantrums, and guilt trips are effective tools and they will use them again. And the toddler tantrums that seemed overwhelming at the time won’t compare to the battle your teenager will be able to put on after years of learning how effective tantrums are against you. Remember that giving in can make things easier in the moment, but it doesn’t accomplish your long-term goals, and can reinforce behaviors you dislike. Sticking to your consequences can be really hard sometimes. One year we had to bar our daughter from participating in a school play – something the whole family was looking forward to – due to one really bad week of homework issues. My husband and I were a strong united front in her presence, and did our own grieving behind the scenes. Avoid empty threats: Saying “I’ll just leave you here in the store” or “I’ll throw away all your toys” can be very frightening to a child and scare them out of proportion with the offense. Then someday they figure out you don’t mean it, and then it’s pointless. Either way, it’s not effective at helping the child behave well. Time outs work very well for some families. It depends on the temperament of the child and of the parent. Successful time-outs are not a punishment. They are a chance for a child to go somewhere quiet and calm down. They come back out when they’re ready to get along again. A typical rule of thumb is for a maximum time-out of one minute per year old. So a 5 year old would have at most 5 minutes. If your child views a time out as a rejection, it might make her very sad. That child might need a “time-in” where the two of you sit quietly together until she calms down. Some children view timeouts as a call to battle, and they only escalate the situation. 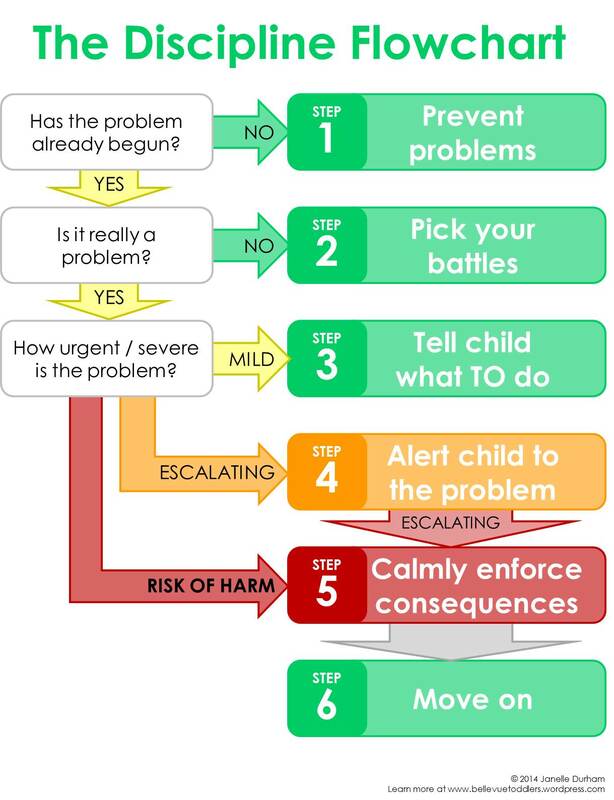 Check out this flowchart for steps which help your child to behave well. This entry was posted in Child Development, Discipline and tagged consequences, discipline, limits, parenting, preschool, toddler on February 4, 2014 by Janelle Durham.